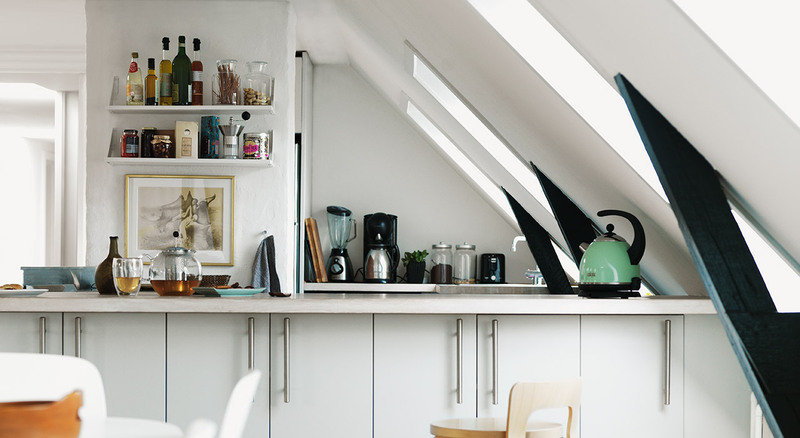 Scroll down to view a selection of Kitchens transformed by VELUX Roof Windows. 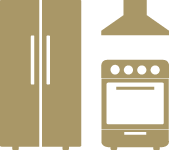 Homes with flat roofs are often dark in the centre and therefore windows designed for flat roofs are the perfect solution to bring in natural light and open up the room. In this example, two VELUX Flat Roof Windows have turned this central Kitchen into a bright, inviting space for family meals and entertaining friends. 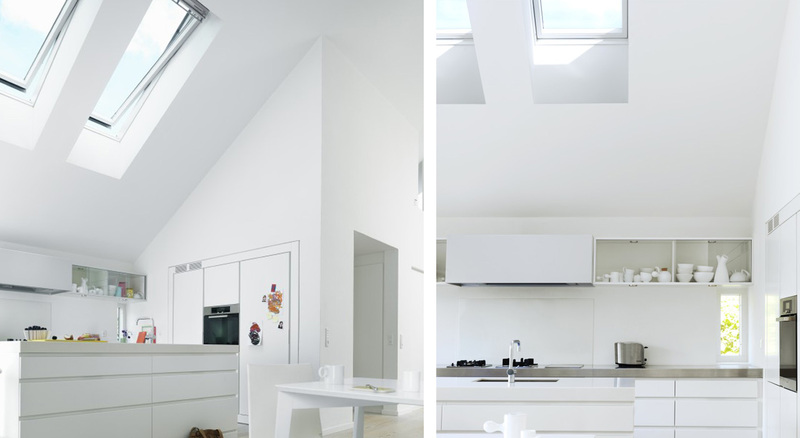 Two VELUX Windows placed high in the ceiling fill the Kitchen with daylight and open up the space. Not only do they provide optimum lighting for cooking, they also funnel steam, smoke and cooking odours out of your home. 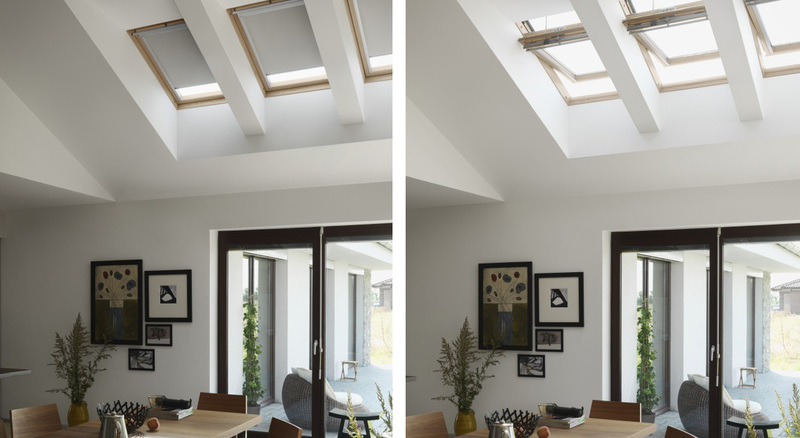 These out-of-reach VELUX INTEGRA® Roof Windows can be opened and closed with a handy control pad. Because of their angle, Roof Windows actually let in more light than traditional Roof Dormers. 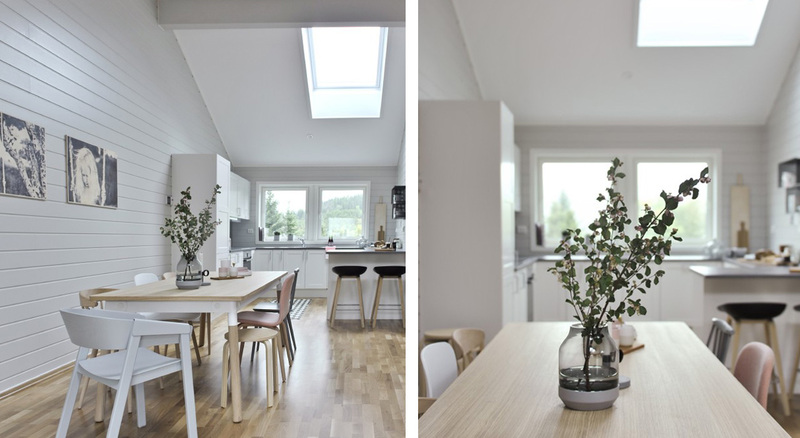 In this example, a group of VELUX Roof Windows brighten up the Kitchen and make the room feel much more spacious. 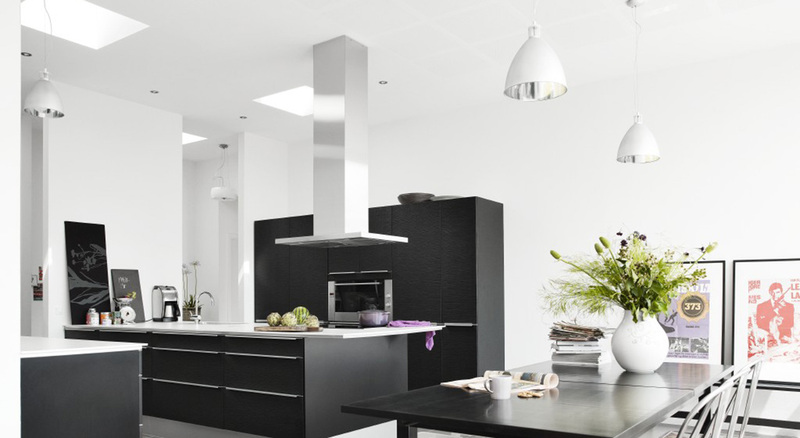 A group of VELUX Roof Windows placed high up in the ceiling provides excellent, even lighting for the entire Kitchen. These out-of-reach VELUX INTEGRA® Roof Windows can be opened and closed with our touchscreen control pad. 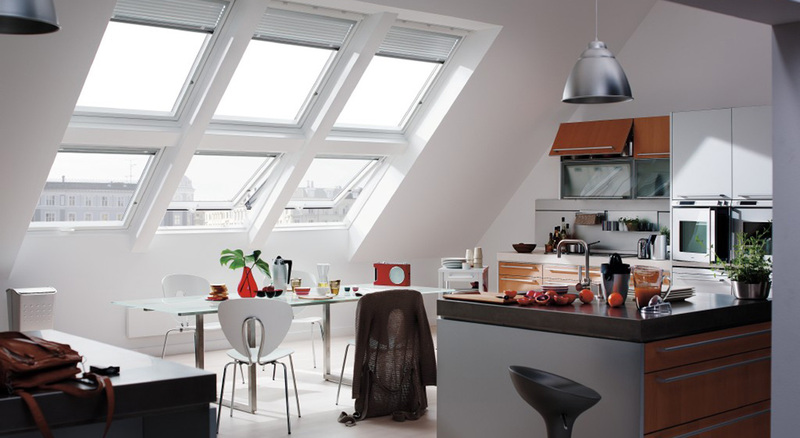 Placed high up in the ceiling, the VELUX INTEGRA® Roof Window provides abundant, even daylight to the entire kitchen. Whenever possible, we recommend placing Roof Windows above the working and dining areas to ensure the best possible light and ventilation where it is needed the most. In this example, a group of three VELUX INTEGRA® Roof Windows fills this upper storey Kitchen with abundant natural light – and offer a fantastic view. All of these VELUX Windows have a practical maintenance-free polyurethane finish and they are fitted with low-maintenance, moisture-resistant VELUX Venetian blinds that are perfect for Bathrooms and Kitchens. In this example an otherwise dark corner has been turned into the centerpiece of this Kitchen. Treetops are almost within reach thanks to this lovely combination of two VELUX Sloping Roof Windows and two Vertical VELUX Windows in a white-painted finish. 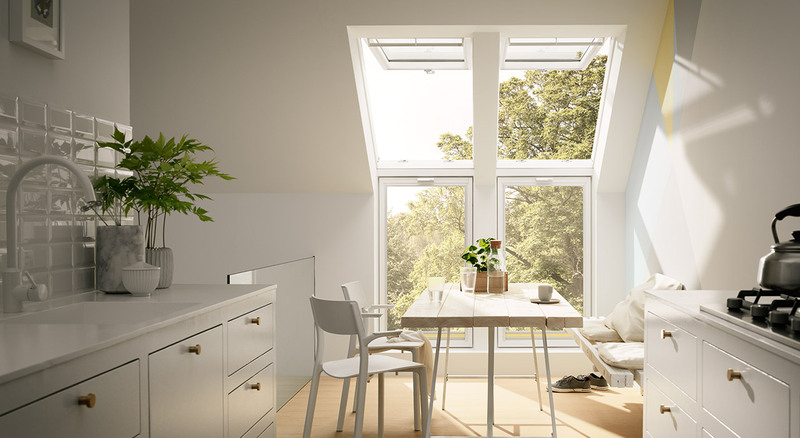 The VELUX Sloping Roof Windows make it possible to lean out and enjoy the outside air while the bottom windows add even more light and stunning views to the already bright room.